Welcome back to another week of Christmas Inspiration with the Art With Heart team. I began this project this time last year, when I was inspired by a biscuit tin that perfectly matched a stamp set from last year’s holiday catalogue…totally trees. The colour scheme also matched our Stampin’ Up! colours (night of navy, pool party, Bermuda bay and whisper white) and I planned to make a card topper to attach to the middle of the lid, covering the words ‘Time for biscuits’. I ate all the biscuits from the tin (the things we do for crafting! ), washed it out, worked out all the measurements, and cut and punched 24 squares of card stock to make the 24 boxes. Can you guess what happened next? Well, let’s just put it this way, maths never was my best subject! I realised I’d calculated incorrectly…only 15 of my 24 advent boxes fitted into the tin and the whole ‘advent calendar in a tin’ idea was a total flop! For the past year my mistake has haunted me every time I opened my craft cupboard. I wanted to throw it into the bin but didn’t want to waste all that cardstock. So yesterday I decided it was time to work out how I could save this project. Just because my boxes don’t fit into the biscuit tin they were designed to fit into doesn’t mean I couldn’t still use them as an advent calendar. I just had to think outside the square. For starters, I could display them on my cake stands. These little boxes can be displayed either horizontally or vertically. And they also look great all lined up on my square cake stand. I also popped them into a the lid of a white box I had and layered a sheet of window sheeting over the top, then tied it all up with a bow. This project is a great way to use a variety of washi tapes, ribbons, silver thread, die cuts and embellishments. I think the more you mix it up, the better it looks. So how do you make the little boxes? Trust me, you don’t want to follow my measurements, but there’s a great online tool called the ‘box buster’ that lets you type in the finished measurements you want for your box. It then gives you the measurements you need to make that size box. These photos below will give you an idea of how I constructed my boxes using my envelope punch board, paper snips and tear and tape. Once you’ve constructed your boxes it’s simply a matter of folding and assembling them, filling them with sweets, toys or a little note, wrapping each box with washi tape or ribbon, decorating with all your coordinating embellishments, and numbering 1-24. Some of the numbers I created using the large numbers die cuts and some were stamped using the labeller stamp set. Well that’s another project I’m glad I didn’t throw into the bin when it didn’t work out the way I originally intended it to! To see what the rest of our lovely Art With Heart Team have made hop on over to Claire’s blog. I’ll be back with some embossing inspiration tomorrow night and them the following week is our last Heart of Christmas blog hop for the year! Do you love advent calendars as much as I do? I’ve always loved advent calendars, but the one I remember most vividly from my childhood was a Christmas card that had a mini advent calendar as its front with a tiny image under each of the 24 flaps. So as soon as we received the “Tabs for Everything” stamp set at Onstage earlier this year, I knew I needed to buy the matching Circle Tap punch and try to recreate this mini advent calendar card from my childhood. The calendar flaps are simply created by punching out garden green, whisper white and cherry cobbler card stock with the circle tab punch, then cutting these punches in half and adhering the “t-bar section” to the card with tear’n’tape. The numbers are stamped with the labeler alphabet stamp set and the wreath in the middle of the card is made using the Santa’s Sleigh stamp set and matching dies, adhered with stamping dimensionals and decorated with silver thread and Rhinestone jewels. I’m really happy with the final result but I will admit it took me a while to figure out how to make this card because most of my stamps do not have small enough images to fit under the Circle Tab punch. It was only when I got my hands on the Be Merry DSP that I worked out how to do this. I used my 3/4 inch (1.9cm) circle punch to punch out tiny images from the DSP…they were just the right size to fit under the tab. And there was enough variety in the design of the paper to allow me to punch out 24 different images so that every day is a suprise! Because the pattern of the DSP wasn’t always centred or even around the main image I’d punched out I simply took my Garden Green and cherry Cobbler Markers out and extended the pattern of the DSP to further enhance the tiny images. The picture below show the bottom 5 images before I used the marker to extend the pattern (the rest of the images have already been done). And here they are all done…I had so much fun doing these! I needed a fairly large sentiment inside the card because I had to make the card base quite big (6 x 6 inches) to fit the 24 tags onto the front, so I used a combination of the stamps from the “Oh, what Fun” stamp set. If you look closely at some of the numbered flaps on the advent calendar you’ll see some brand new gorgeous little ornament shapes in whisper white that I’ve used to stamp the numbers onto. 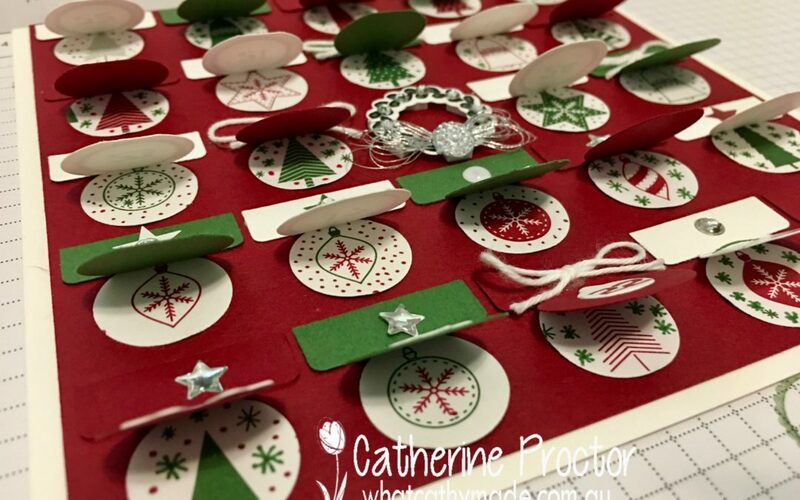 These are dies from a new Christmas bundle called “Carols for Christmas”, which you can order from the 1st August, one month ahead of the Holiday catalogue release date. 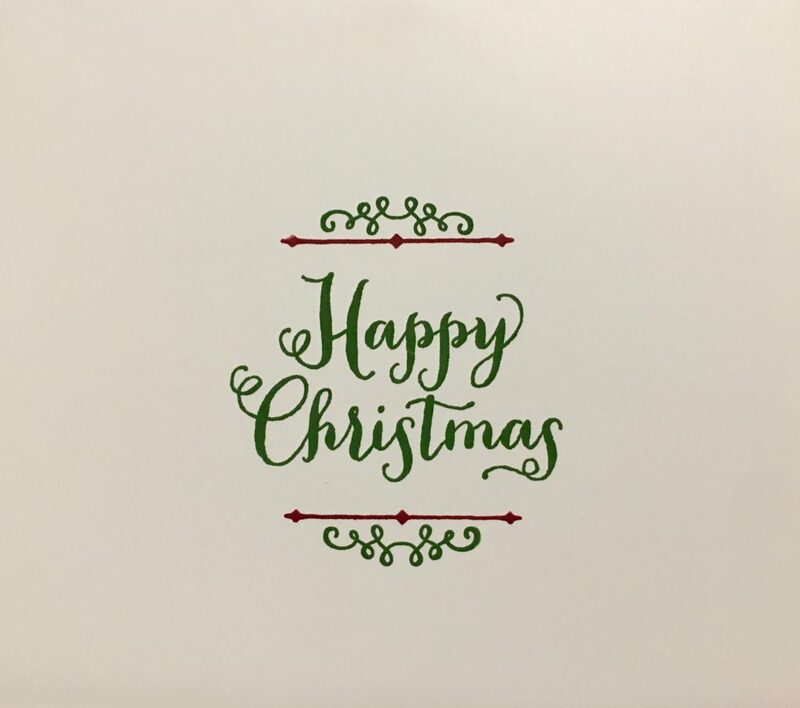 You can see these little dies on the “Deck the Halls” card below, but in this picture they’re stamped with the ornament stamp from the Carols for Christmas set. You can also click on the links below to purchase any of the supplies I’ve used for this card.